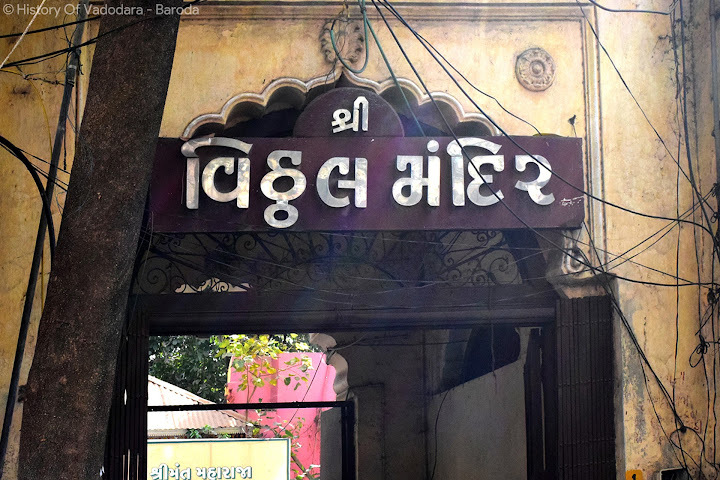 Located near Mandvi Gate and just Opposite to Sarkar Wada, there is a beautiful 201 Years Old Vitthal Mandir. It was constructed by Maharaja Govindrao Gaekwad’s Wife, Maharani Gahinabai. It is said that this temple was made from Maharani’s family’s and own money. The outer side of Temple is made like Haveli. The Temple main portion stands erect on 10 pillars. The upper part of Main portion was brought down in Year 1962 as it was not in a good condition. Before making this Temple, maharani went to Dauji Temple. After construction of temple was finished in Year 1866, at the Day of Vaishakh Vad Pancham, the Idol of God’s were placed. There are two Silver Coated Paintings of Rag-Ragini at each side of main Big Door. Going inside from Main door, there are idols of Vitthoba and Shri Vitthal. Also there are idols of Satyabhama on Right Side and Rukmanidevi on Left Side respectively. It is said that these idols were bought from Village of Maharani Gahanabai from Maharashtra. *There were two tanks inside the Park of Temple, which were constructed in a style that if anyone adds water to tank, the fountains started to work. Still there is one part of this Broken Tank here at temple.